Prayer ties – empty yourself of the prayers of your heart that are expressed as wishes, wants, desires, hopes. 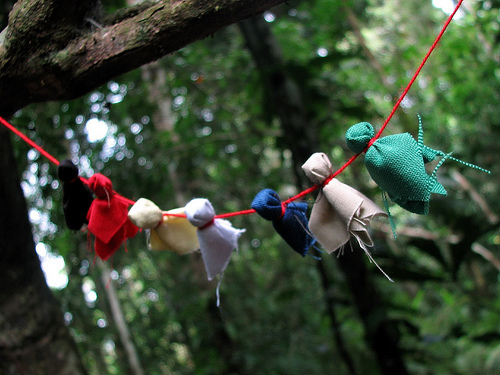 Place them with grains of rice, or tobacco sacred to Native Americans, or cornmeal, in squares of cloth that you no longer need, tie them with thread, all together, smudge them, and then give them to the elements. Be aware that as your fingers make the ties, you are nurturing your entire body since Sujok Smile Healing shows us that all parts and organs and energies of our body are in our hands. Be aware that as you voice your wishes, wants, desires, hopes to yourself, you are bringing them to your awareness, allowing them space to be acknowledged. Be aware that as you tie them together, you realize that they are all inter-connected, whatever they may be. Be aware that as you smudge them, you are bringing the sacred into their physicality. And then a prayer will come from your heart, and it will be the one that your heart is sending out to the universe. It will be a prayer not of want,need, desire or hope. It will be a prayer of gratitude and thanksgiving for all beings and things on earth. This is very interesting. Thanks for posting.